Description: This wildflower is a herbaceous perennial about 1-2' tall. The central stem and any lateral stems are light green to reddish green, 4-angled, and glabrous. Pairs of sessile opposite leaves occur along these stems. Individual leaves are 1-2½" long and ½-1½" across; they are lanceolate to ovate and dentate along their margins. The elongated teeth of the margins have narrow tips that bend toward the tip of each leaf blade. The upper surface of each leaf is medium green and glabrous; it has a wrinkled appearance because of the indentations along its veins. The lower surface of each leaf is pale to medium green and either glabrous or nearly so. The foliage of Spearmint has a moderately strong minty fragrance. The central stem and any upper lateral stems terminate in dense spikes of whorled flowers about 1-6" long. At the apex of the central stem, the inflorescence typically consists of a central spike and 2 smaller lateral spikes. Individual flowers are about 1/8" (3 mm.) long, consisting of a short tubular calyx with 5 narrow teeth, a short tubular corolla with 5 lobes, 4 strongly exerted stamens, and a pistil with a single style that is divided at its tip. The calyx is light green to reddish green and glabrous, while the corolla is white to light pink. The blooming period occurs from mid-summer into fall, lasting about 1-2 months. Afterwards, each flower is replaced by 4 small nutlets that are located within the persistent calyx. The shallow root system is fibrous and rhizomatous. Clonal colonies of plants are often produced from the rhizomes. Cultivation: The preference is full or partial sun, moist conditions, and soil consisting of fertile loam. 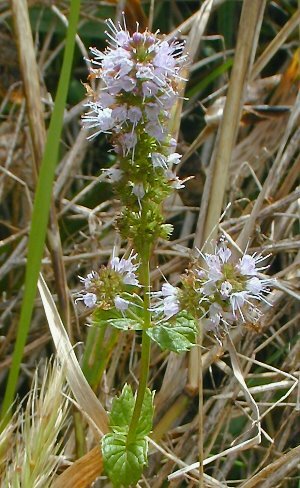 Spearmint can spread aggressively in open areas where there is limited competition from taller plants. Sometimes it is adversely affected by rust-related foliar disease. Range & Habitat: Spearmint is occasional in scattered localities throughout Illinois (see Distribution Map). Spearmint was introduced into North America from Europe as a medicinal and culinary herb, but it has escaped from cultivation and naturalized in mainly disturbed habitats. These habitats include low areas along rivers, damp weedy meadows, roadside ditches, areas along the foundations of buildings, edges of yards, and vacant lots. Spearmint is often cultivated in gardens. Faunal Associations: Generally, the flowers of Spearmint and other Mentha spp. (mints) attract nectar-seeking small bees, wasps, flower flies (Syrphidae) and other flies, the Cabbage Butterfly (Pieris rapae) and other small butterflies, and skippers. Other insects feed on the foliage and other parts of mints. This latter group includes the caterpillars of such moths as Agriopodes teratophora (The Gray Marvel), Haploa lecontei (LeConte's Haploa), Pyrausta acrionalis (Mint-Loving Pyrausta), and Sphinx eremitus (Hermit Sphinx). Other insect feeders include the leaf beetles Kuschelina gibbitarsa and Longitarsus ferrugineus, and the stink bug Coenus delius. Vertebrate animals largely avoid mints as a food source, although the Ruffed Grouse reportedly eats their leaves (Bennetts, 1900). Photographic Location: A low area along a drainage ditch near Urbana, Illinois. Comments: Among the various Mentha spp. (mints) and their hybrids, Spearmint makes one of the better-flavored mint teas. 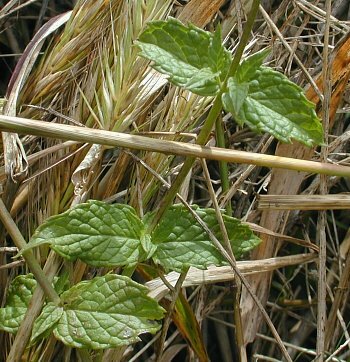 Spearmint flavoring is also used in chewing gum and other products; it has significant economic importance. Spearmint has been widely cultivated since ancient times, and was introduced to the British Isles by the Romans. Distinguishing the various mints and their hybrids is often rather difficult. Spearmint can be identified by its hairless stems and leaves, the lack of petioles on its leaves, the wrinkled appearance of its leaves, the pleasant mint fragrance of its leaves, and its terminal spikes of flowers. Other mints tend to be more hairy, their leaves usually have petioles and they are less wrinkled in appearance, their leaves may not have a pleasant mint fragrance, or their flowers may occur in axillary whorls above the leaves.